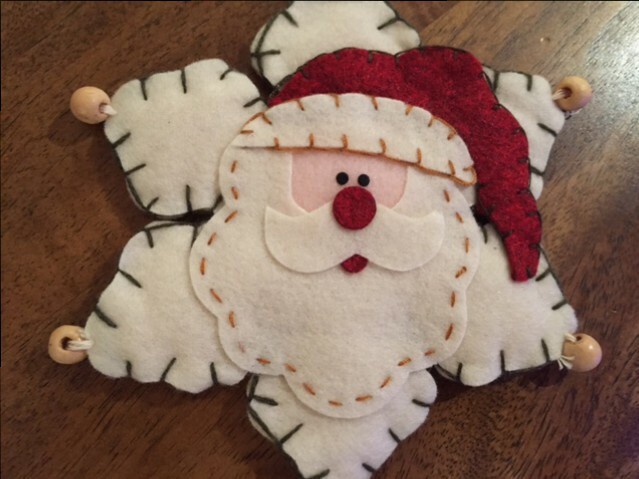 I have been lucky enough to call Australia home for the last seven festive celebrations. The Summer weather and extended holidays have been easy to adapt to. But when it comes to my Christmas Day feast moving away from my childhood British traditions has taken more convincing. I’m talking roast pork with crunchy crackling or slow-cooked lamb shoulder served with Yorkshire puddings and brussel sprouts. But this year things are going to be very different. Because, after enjoying a friend’s smoked ham at a Thanksgiving dinner, I decided on a more Australian Christmas roast and ordered an organic smoked ham from my local butcher. Only then did I realise there are tons of options for the glaze – using everything from cider, to oranges, to spices, cider and marmalade. Here I’m covering my three top picks – one from my friend Kate and two recipes from well-known chefs, Jamie Oliver and Pete Evans. To prepare the ham carefully slice off the top layer of skin but leave on the fat. Then using a sharp knife score a diamond pattern into the fat without scoring so deep that you slice into the meat (ask your butcher kindly and they may do this for you). Place the ham on a wire rack in a large roasting tin before moving to step 2. The glaze quantities here are based on a 5kg to 6kg ham (adjust the quantities for a smaller or larger ham). Method: Heat a pan over a very low heat and add the marmalade, honey and apple cider vinegar. Then add the bay leaves, cinnamon, allspice, peppercorns and cloves, as well as the picked rosemary leaves. Slice the (optional) chilli in half lengthways and add it to the pan as well. Warm the mixture for just a few minutes to allow the flavours to develop. Allow the glaze to cool so that it sticks better. Then take out the bay leaves, cinnamon stick and chilli and what remains can be coated thoroughly over your ham. To cook – see step 3. 3 large apples (halved) & 3 peaches (halved and stoned) – add these halfway through the cooking time and baste the fruit as you baste the ham. Method: Combine the glaze ingredients (not the fruit) with 3 tbsp of water and mix well. Then spread the glaze thoroughly and generously over the ham. To cook – see step 3. Method: Place one clove in the centre point of each diamond carving. Then combine the remaining glaze ingredients and mix well. Spread the glaze thoroughly and generously over the ham. To cook – see step 3. Ensure the ham is placed on a wire rack in a large roasting tin. Cook in a pre-heated oven at 160C to 170C for between 1 hour and 1 ½ hours. Be sure to baste the ham a few times during the cooking process to build extra flavour. You’ll know the ham is ready when it is golden and crispy. Remove from the oven and leave to rest (loosely covered with foil) for 15 minutes before carving. Serve with a side of pickled and spiced cherries (recipe here). Note: Cooking times and temperatures vary depending on your oven and the size of the ham. Buy the best quality pork you can find from a reputable butcher or farmer – this does mean spending more to buy free range or ideally organic but the result is worth it. When you’re considering the cost remember that you’ll have heaps of leftovers for Boxing Day and the bone can also be cooked to make a huge portion of soup. As an alternative to using the oven you can cook your ham on your (hooded) BBQ with the hood down at about 50% of full heat. Jamie Oliver’s top tip is to keep a close eye on the glaze while the ham cooks because it will take on too much colour and can burn. 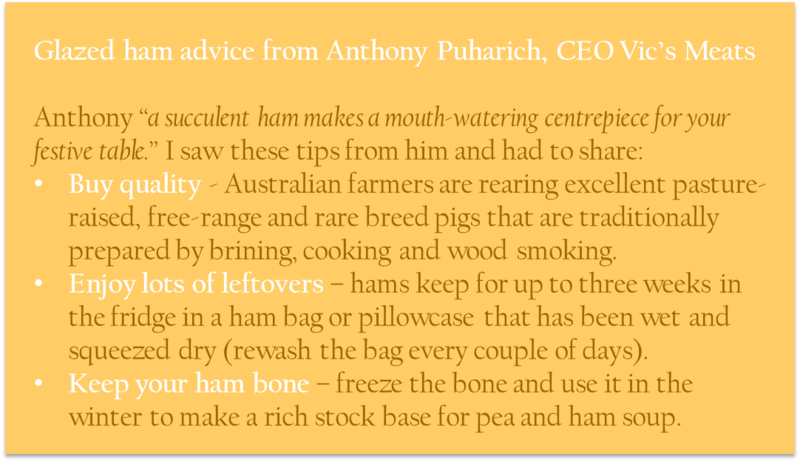 And here’s some more tips from the CEO of Vic’s Meats. Tags: BBQ, brown sugar, Christmas, cloves, ha, honey, marmalade, orange, oven, recipe, roast, sherry, smoked. Bookmark the permalink. You def can’t beat a glazed ham. I use ginger marmalade for mine. Oh so tasty! 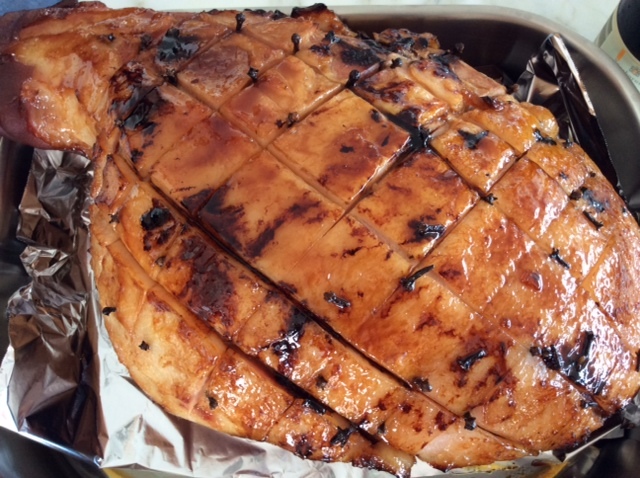 Yes I’ve seen another recipe using rhubarb and ginger too that I might try next week – too many choices, but very excited about my first roast smoked ham!